Lock in a great price for Holiday Inn Niagara Falls-By the Falls – rated 8.2 by recent guests! Location of hotel, clean facilities, quiet , family friendly and professional friendly staff. Rooms were modern and loved the balcony. Free parking on site and Wi-Fi. Staff was incredible, rooms and common areas were clean, and front desk was accommodating and ready to answer our questions about the area. Breakfast was simple, but tasty, although I wish the buffet was not an extra charge for kids (selecting off the menu was free for 12 and under, but the breakfast buffet was an upcharge). 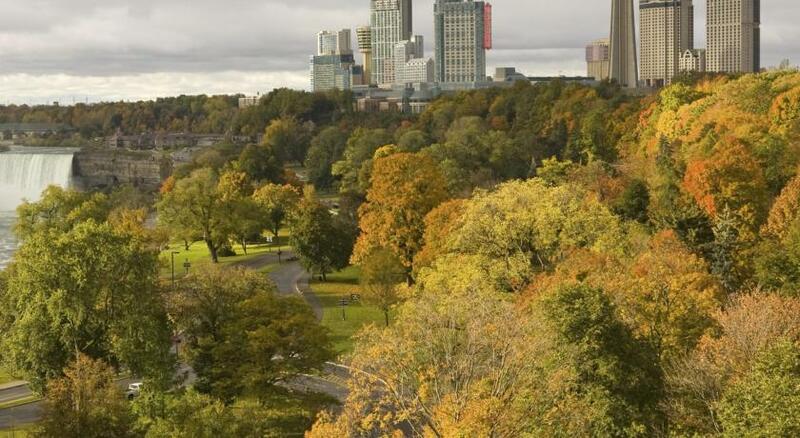 Great proximity to the falls, shopping, and other attractions. The great thing about Holiday Inn is, there is no surprise. Quality is consistant across the board in everyone of their facilities. The restaurant Coco's was amazing, delicious food & kind working staff! The location was in the heart of the falls. 5 minute walk to falls. 15 minutes to Clifton Hills. The best location. Location is good and parking is free. Room was clean and hardwood floors. Holiday Inn Niagara Falls-By the Falls This rating is a reflection of how the property compares to the industry standard when it comes to price, facilities and services available. It's based on a self-evaluation by the property. Use this rating to help choose your stay! 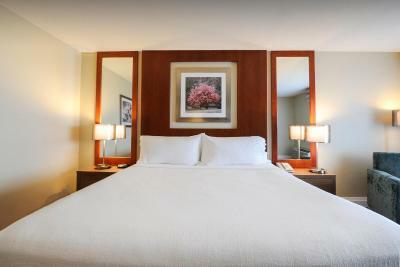 Adjacent to the Skylon Tower in the heart of Niagara Falls, this Ontario hotel features an indoor and an outdoor pool. It features a fitness center, full service restaurant, and free wireless internet access. Modernly decorated, each room comes with a flat-screen cable TV with satellite channels, mini-fridge, ironing facilities and a coffee maker. A hairdryer and toiletries can be found in the bathroom. Some rooms have a spa bath and steam shower. On-site dining is also available at the Coco Terrace Steakhouse and Mr. Coco's Pizza Bar and Lounge for breakfast, lunch and dinner. Room service is also available upon request with surcharge. Holiday Inn Niagara Falls-By the Falls is just 5 minutes' walk from the Fallsview Casino, scenic Queen Victoria Park is only 0.6 mi from the property. Various shops, restaurants and entertainment options of Clifton Hill are 3 minutes' drive or less than 20 minutes' walk. When would you like to stay at Holiday Inn Niagara Falls-By the Falls? Provides a 2-person spa bathtub with skylight overhead and a private balcony with views of the city. Free Wi-Fi and a flat-screen cable TV are provided in this non-smoking room. A coffee maker and desk are furnished. This room features an over-sized luxury shower and a private balcony. Provides a private balcony and a seating area with sofa bed. Please note that the room rate is based on 2 guests. Maximum occupancy is 4 guests (see Hotel Policies for extra person charges). Free Wi-Fi and a flat-screen cable TV are provided in this nonsmoking room. A coffee maker and desk are included. This room is wheel chair accessible. This room offers a wheel in shower and is wheelchair accessible. House Rules Holiday Inn Niagara Falls-By the Falls takes special requests – add in the next step! Any additional children or adults are charged CAD 10 per person per night when using existing beds. Holiday Inn Niagara Falls-By the Falls accepts these cards and reserves the right to temporarily hold an amount prior to arrival. For any Room Including Breakfast: Additional occupancy above 2 adults in the room are charged 12.95 plus taxes and fees for breakfast. Children under 12 eat free. Children above 12 are charged 12.95 plus taxes and fees for breakfast. The room was great, clean and tidy. Bigger than expected. Staff was great. We were late leaving Toronto, hotel called to confirm we were still planning on coming. Thought that was a nice touch, that they called to confirm. Cleanliness around the pool.area was below standards and needs improvements. The restaurant was in the premises of the hotel and was very convenient. It seemed to be family run business and had friendly staff. Enough options to keep kids happy. Pool hours could of been earlier instead of 10:30a to 10:30p, only 1 microwave located on 2nd floor in laundry area. Would of preferred a higher room floor in which I requested but hotel couldn't accommodate. No light fixtures in rooms only lamps so room was very dimmed. Breakfast should be included didnt like the fact you had to pick the nightly rate with the breakfast included which was more costly! The location near the falls and the reception and breakfast staff are friendly and helpful. The pool was crowed with kids. Generous space and facilities, although there could be more tea and coffee provideo in the room. would prefer that breakfast buffet not be an upcharge for kids eating "free"